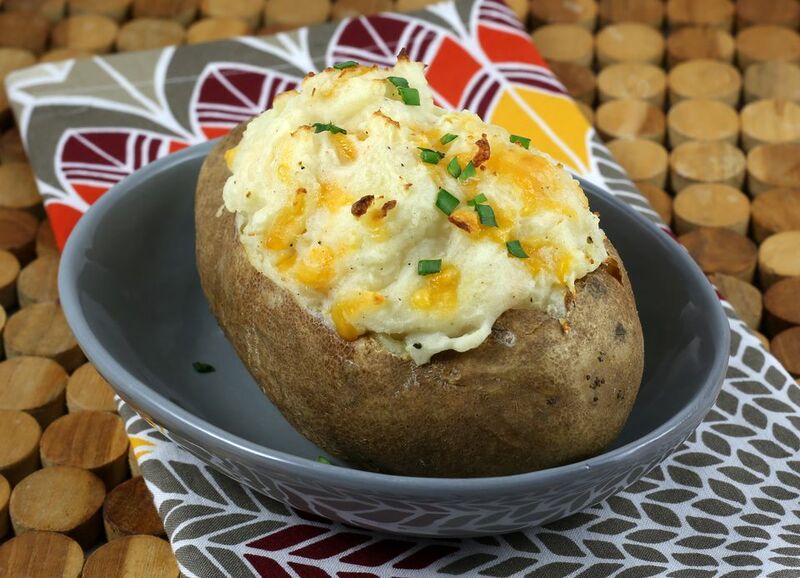 These twice-baked potatoes are a wonderful change of pace from everyday baked potatoes or the "same-old" mashed potatoes. The potato skins are filled with the savory mashed potato mixture and then the baking continues until the topping is golden brown. Feel free to omit the chives or use sliced green onions in the filling instead. The mashed potato filling is excellent with cheddar cheese as well. Rub them lightly with olive oil or shortening and pierce them with a fork in 2 or 3 places. Place them directly on the rack in the preheated oven and bake them for about 1 hour or until fork tender. Remove the potatoes to a rack and reduce the oven heat to 375F. When the potatoes are cool enough to handle, split them lengthwise and scoop the potato into a mixing bowl, leaving the potato skins intact. Add the cream cheese, chives, butter, 1/2 cup of Parmesan cheese, and sour cream. Beat until smooth. Taste and add salt and freshly ground black pepper, to taste. Add the egg and beat until smooth. Fill potato skins and sprinkle with additional cheese, green onions or chives, and paprika, if desired. Bake at 375F until the filling is hot and lightly browned.